Huawei today announced the Watch GT, a smartwatch that has a traditional appearance and focuses on fitness. Huawei says the Watch GT is designed for "urban explorers" and can track a wide range of activities. The device can automatically track running, swimming, cycling, cross fit, hiking, and walking. The device has a round, 1.39-inch AMOLED screen that's surrounded by a ceramic-coated bezel and stainless steel chassis. The wearable features excellent battery life. It relies on a dual-chip system so it can separate low- and high-power tasks. Huawei says it relies on AI to understand what the wearer is doing and it will automatically switch to power-saving mode when it can. As a result, the device supports up to two weeks of battery life with the heart rate monitor on and tracking 90 minutes of activity per week. With heart rate and GPS off, the wearable can offer the time, messages, and calls for up to 30 days. With continuous exercising, and the GPS/heart rate monitor active, the battery lasts about 22 hours. The device features a six-sensor heart rate monitor to record the most accurate measurements. The UI is not based on Google's Android Wear OS, as Huawei's older watches are. Instead, it favors a Wear OS-like UI that Huawei developed itself. The Classic version costs €249 and the Sport version costs €199. They will be available later this month. 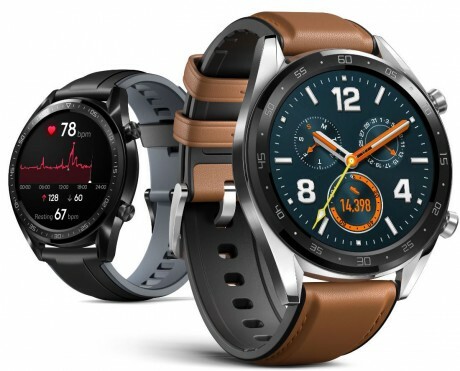 Huawei today announced the Huawei Fit, a watch-like fitness band similar to the Honor Band Z1, but with a heart rate monitor and additional fitness functions. It's designed to work with a companion app called Huawei Wear, available for both Android and iOS. Google today unveiled a new version of Google Fit, its app for tracking fitness activities. Google says the revised app focuses on two activity goals based on recommendations made by the American Heart Association and World Health Organization: Heart Points and Move Minutes.